Hobie Pro Angler 12 Review – What Makes this Fishing Kayak so Great? Kayak Fishing is not always the easiest thing to get into, especially when you do not have the right kayak for it. Often times the kayak is either not designed for the needs of a fisherman or it is simply not stable enough on the water to do activities such as fly fish or even stand up fishing. Worse yet there is absolutely no room to store the gear that you want to bring with you without it sliding around everywhere, especially if you are in a canoe. Many Fishing Kayaks/ Canoes are also limited to certain environments meaning you need another type of fishing vessel to do some ocean fishing which can get even more expensive than previously thought. Wouldn’t it be better if you had an all in one vessel that can take you to where you needed to go and fulfill all of your fishing needs? The Hobie Pro Angler 12 may be the answer you are looking for. Who is the Hobie Pro Angler 12 For? Who is the Hobie Pro Angler 12 not for? What is the Hobie Pro Angler 12 used for? The Hobie Pro Angler 12 is meant for the customer that wants the best possible kayak fishing experience. As mentioned above these kayaks are fully customisable with a variety of add-ons that can be added to enhance your fishing experience like additional add-ons to the H-Rail system, or a Lowrance Ready System that has proper all the inserts needed for installation. This boat can be used for a casual paddle as well, although this is more specially designed for the serious fisherman who wants a vehicle that can handle a variety of different water conditions. 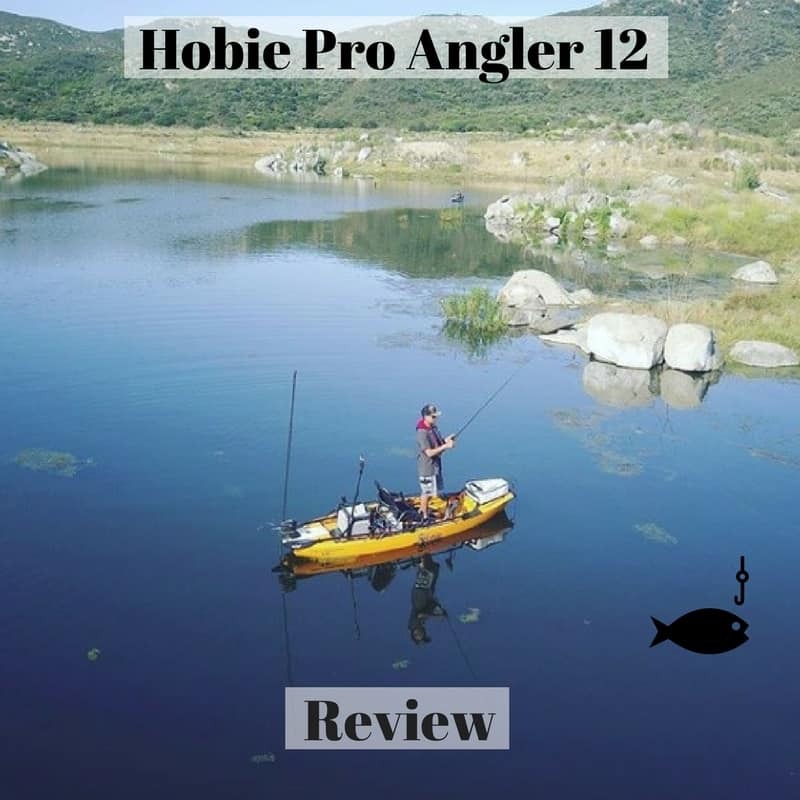 The Hobie Pro Angler 12 is ideally meant for calmer waters like lake fishing and can turn on a dime making it a great kayak for tighter river ways as well. Having said all this the kayak can handle coastal oceans as seen below in the following clip. The Hobie Mirage Drive allows you to go about kayaking in a hands free manner which allows you to put your hands to good use with that fishing rod! This is huge because you don’t need a paddle to propel this kayak forward meaning you don’t have to worry about placing a paddle down and potentially losing it. The science behind the Mirage Drive is quite smart, it allows you to use your most powerful muscles (your legs) to propel the boat forward as opposed to your arms which are weaker. How it works is that it is powered by fully adjustable pedals which propels the fins in the water making a criss cross motion. When in shallower water it is better to do smaller peddle movements allow the fins to not hit the bottom of the shore. The Hobie Mirage Drive features Glide technology which includes the addition of roller bearings at key friction points reduces resistance for a hassle free ride. The Hobie Pro Angler 12 features the upgraded ST Turbo Fin which is an increased fin surface area and length to provide more power with each stroke you take. The Vantage Seating System is one of the better seating systems in the kayak world because of it’s adjustability and Boa Seat-back technology. The adjustability comes from three different points, the seat bottom, the seat back and the lumbar support. The seat bottom and seat back can be adjusted using the arm rests while the lumbar support can be adjusted behind the seat by simply twisting a wheel to fit your back size. You can also change the seat to a different position which allows you to be more upright for fish spotting or when you are about to stand up and cast. The-Rail Mounting system features on the Hobie Pro Angler 12 allows you to add a wide variety of different devices to the edge of your kayak including rod holders, Mounting Plates, Cup Holders, Tackle Bins, Ram Ball’s, Starport HD Mount, Mighty Mounts and Gearhead Mounts. A lot of these additional accessories can be moved simply by opening the lever located on any of the accessories and sliding them. The drillable mounting plates are located towards the front of thr kayak at the beginning of the H- Rail system. If you are not interested in putting anything on the H Rail system you can always mount accessories like fish finders, cameras, rod holders as well has the H Bar. While the package does not come with a Lowrance fish finder the kayak does include a built in cavity to place the transducer and drilled all the holes and included the waterproof plugs to accommodate this system. The Hobie Pro Angler 12 is well thought out when it comes to storage with Four storage areas all with different purposes in mind. Starting from the front of the kayak the front hatch features ample storage space for storing fish ice or other larger items in mind. It can also be removed for cleaning purposes. The Twist and Seal Hatch features a pop up tackle box system which allows you to easily grab lures and other tackle needed to fish. There is also a net on the Lid of the hatch for any easily accessible lose tackle. Towards the back there is a Live Well- Ready Cargo area accompanied by a 8” Twist and Seal Hatch which is anchored down using a corkscrew mechanism. The Hatch is water proof and the lid is permanently attached to the base so that you don’t have to worry about forgetting it! Both the Skeg and the Rudder systems are retractable allowing you to adjust to the conditions you are paddling in. To retract the rudder you simply pull a cord and a rudder will drop down to steer you instal a rudder handle that goes on the right or left side of the boat allowing you to steer right or left. You can also adjust how much play is in the handle with the boa knob located just ahead of the steering handle. Deployment of the skeg happens when you uncleat the sked deployment cord into the Hull. The retractability of the Rudder and Skeg are important things to remember when heading back to shore. H- Rail Mounting Bar that allows you to decorate your kayak with a wide range of accessories. The Vantage Seating system allows you to be out on the water for a long period of time. The Hobie Pro Angler 12 can take a variety of different bodies of water but works best with calmer waters. The Hobie Pro Angler 12 is great for tighter rivers and lakes. It can also handle chop and a bit of surf that Coastal Waters have to offer. “After having spent several months researching kayaks, it has been my privilege to own the Pro Angler 12. I fish a lake in Northern Alberta called Wabamun. Indian for “mirror”. This lake is a world class fishery. Monster pike, that of 5 feet and 40 pounds have been caught. Three feet plus and 20 pounds, very common. A home for the “gators” of Alberta. “My husband and I bought Pro Angler yaks 4 months ago. We have saltwater fished every weekend since purchase. Tons of room! Yak has built in ice chest, 4 rod storage, hidden tackle boxes and most comfy seat ever. The H bar is another major plus. “There were only a few dislikes about the PA 12 so I’ll start off with those. Weight – I had the same gripe about the Pro Angler 14 and even though Hobie cut out about 20lbs the PA 12 is still very heavy. The one I used with bottom machine, battery and fishing gear felt more like 150lbs. This is fine if you are launching at a ramp with a trailer but any long hauls to the water or portages will be taxing in this boat. I would also be hesitant to car top this boat. Cost – At $3,099 the PA 12 is only $100 cheaper than the PA 14. This is still above many kayak anglers budgets. In my humble opinion this is just about as good of a fishing kayak as you can buy. Everything about this kayak is well thought out from it’s extremely stable Hull design to the very comfortable Vantage seating system and it’s H-Rail system. The features that comes with it is very customizable. The Kayak allows you to even have a Lowrance fish finder with a plate mount on the bottom to really take your fishing game to the next level. The price tag may be a bit much and the kayak is heavier than many others, it is definitely worth its weight both in cost and weight with so many built in features associated with it to help your life become easier when out on the water looking for that big catch. If price or weight is not an issue for you this is definitely the kayak to purchase for your fishing destinations. In my mind the price is fully justified with all the additional options that can be equipped with this kayak. Looking at all the customer ratings there are very few negative customer reviews about this boat.